Both books are aimed at 3-6 year-olds. The first book is about "Asli, who has never been to Somalia, but now she is going there with her father to meet her four grandmothers". Swedish children, evidently, are supposed to learn that the Islamic practice of polygamy -- illegal in Sweden -- is completely normal. 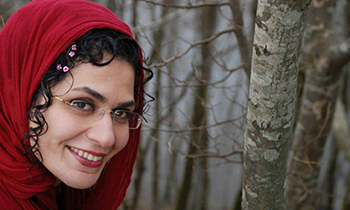 Swedish libraries are evidently not concerned that books normalizing the misogynist practices of Islamic polygamy and covering women from top to toe, aimed at Swedish toddlers and children, might also be considered "offensive", not to mention criminal. How curious, then, that the Swedish government laments Nazi marches in the streets of Gothenburg, yet is happy to spend large sums of Swedish tax payer money on those who agree with the Nazis on the streets of the Middle East. The country that censors "offensive" words from children's books -- Swedish publishers and libraries have censored, among others, the classic Astrid Lindgren books about Pippi Longstocking -- has apparently found politically correct replacements. Farfar har fyra fruar ("Grandad Has Four Wives") and Mormor är inget spöke ("Grandma Is Not a Ghost"), two books written by the Swedish author Oscar Trimbel, were featured at the book fair in Gothenburg recently. Both books are aimed at 3-6 year-olds. The first book is about "Asli, who has never been to Somalia, but now she is going there with her father to meet her four grandmothers". Swedish children, evidently, are supposed to learn that the Islamic practice of polygamy -- illegal in Sweden -- is completely normal. The second book, "Grandma Is Not a Ghost", which features a drawing of a grandmother in a full-length jilbab on the cover, tells the story of "Omar, who meets his grandmother from Somalia. Omar wants to dress up as a ghost for Halloween and he wants his grandma to come along so that it will be spooky". Apparently, Swedish children are supposed to learn that the jilbab, which covers a woman from head to toe, leaving only the face visible, is not a frightening ghost costume, but completely commonplace dress for women to wear. Swedish libraries are evidently not concerned that books normalizing the misogynist practices of Islamic polygamy and covering women from top to toe, aimed at Swedish toddlers and children, might also be considered "offensive', not to mention criminal. On the contrary: Stockholm Library had already ordered "Grandad Has Four Wives". After two Swedish news outlets wrote about the books, however, the author, Oscar Trimbel, announced that he will be taking "Grandad Has Four Wives" off the market. He gave no reason for his decision. Double standards are extensive in the Swedish establishment not only when it comes to children's books. 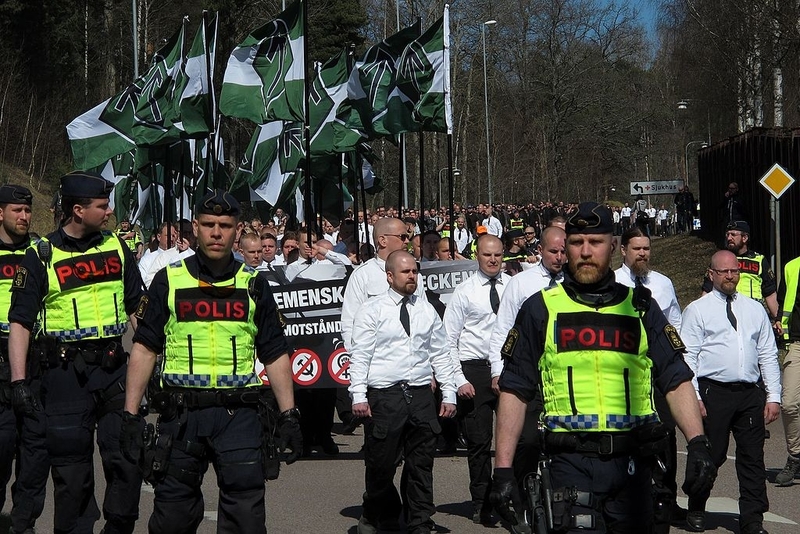 On September 30, Swedish authorities were ready to allow a group of Swedish neo-Nazis, the "Nordic Resistance Movement" (NMR), to march in Gothenburg, close to a Jewish synagogue, which would be full as that day was Yom Kippur, the most significant Jewish holiday of the year. Despite protests, the Swedish police refused to listen to the Jewish community's concerns, but a Swedish administrative court finally rerouted the march. Hundreds of people reportedly showed up for the NMR march, many of them armed with shields and helmets, while an estimated 10,000 counter-protesters turned out. A small group of so-called "anti-fascists" clashed with the neo-Nazis, as well as with the police. According to police, over 30 people were arrested and one officer lightly injured. The police had anticipated violence and had called in reinforcements from all districts in Sweden. One Swedish observer estimated that the NMR march had largely failed due to low participation numbers and a failure to reach the actual destination of the march. While it is curious that the police allowed the march to take place when it did -- it could have been moved to another day and another area of the city -- the reaction of the Swedish government to the Nazi demonstration was even more noteworthy. After the march, Swedish Prime Minister Stefan Löfven said he plans to invite center-right opposition parties to discussions on how to "counteract antidemocratic forces in the country". "My entire political career has been driven by what I learned in school about the Holocaust... to condemn antisemitism... is a democratic obligation... We are witnessing increased intolerance and hatred in Sweden, in Europe and around the world... It is everyone's responsibility to ensure that history does not repeat itself". The problem is that the Swedish government has not exactly done much to "ensure that history does not repeat itself". While the neo-Nazi march was a welcome occasion for the government to pretend that it cares about anti-Semitism, the government's show of concern was highly questionable. "Empathy" from the Swedish government only surfaces when anti-Semitism originates from Nazi groups. The far more widespread Muslim anti-Semitism, which entered Sweden with the many Muslim immigrants, barely elicits any reaction on the part of ministers such as Wallström, who has called Israeli self-defense against Islamic terrorists "extrajudicial executions". She also famously linked the November 2015 Paris attacks to the Israeli-Palestinian Arab conflict, indirectly blaming Israel for the ISIS massacre in Paris, and allegedly even saying: "the Jews are campaigning against me". Muslim anti-Semitism is rife in Sweden, as already substantiated by a Swedish report in 2003, but the Swedish establishment hardly talks about it; they prefer to talk about "Islamophobia". In addition, Sweden continues to support the Palestinian Authority (PA) with millions of dollars, in spite of the fact that the PA instigates anti-Semitism, incites terrorism and uses half of all foreign aid to reward and incentivize terrorism. Since its inception in 1993, the PA has systematically indoctrinated its citizens with an incessant barrage of enjoinders to commit jihad against Jews. From the moment children enter kindergarten, they learn, in line with Quranic passages 5:60 and 7:166, that the Jews are cursed and that Allah transformed them into apes and pigs. Hatred of Jews is taught in schools, where Israel is erased from the map, and Jewish nationhood and the Holocaust are denied. Jew hatred is preached in the mosques, on the internet, TV and radio, and manifests itself in the statues the PA erects in its city squares in the memory of terrorists as examples for its youth to emulate, and even in crossword puzzles. Unsurprisingly, Hitler's Mein Kampf has been a bestseller throughout the Arab world. In 1999, the Middle East Media Research Institute (MEMRI) reported that the Arabic translation of Mein Kampf had also become a bestseller in territories controlled by the PA. When in 2005 Mein Kampf was published in Turkey, it became an instant bestseller, with more than 100,000 copies sold in two months. The Swedish government also funds groups trying to obliterate Israel. How curious, then, that the Swedish government laments Nazi marches in the streets of Gothenburg, yet is happy to spend large sums of Swedish taxpayer money on those who agree with the Nazis on the streets of the Middle East. It seems to me that Sweden has completely given itself over to Islam - not only because of what is said above but because the king and queen seem to have accepted that their country will become an Islamic state, for no good reason, except perhaps fear of the consequences if they do fight it. It's a dilemma but one they must confront and deal with very quickly. A clear example of Democracy sowing the seeds of its destruction. In truth Europe, including Sweden, has always had an unhealthy streak of anti-semitism. Nazism did not arise in a vacuum. On the one hand, people are walking around in a uniform which loudly proclaims an ideology, which the wearers fervently believe, calling for the conquest of all non-Germans and the annihilation of the Jews. On the other hand, you have people walking around in a uniform which loudly proclaims an ideology, which the wearers firmly believe, calling the conquest of all non-Muslims and the annihilation of Israel and all Jews. That's OK, because that's "diversity". That's Sweden...and UK and France and Germany. The critical issue in Sweden today, for Swedes, is non-white immigration. A majority of Swedes want it stopped, and many want it reversed. This includes Swedish neo-Nazis. I infer (but not confidently) that most Swedish Jews also want it stopped. So, Swedes, Swedish neo-Nazis, and Jews in Sweden all agree on this. As I said, non-white immigration in Sweden is an issue of life-or-death for the Swedish people. In the struggle to preserve Sweden, if the enemy of my enemy is my friend, then what is the enemy of my friend? Don't worry about it! In next to no time, the way things are going, the only acceptable books in Swedish libraries will be Korans. All self-inflicted, and quite frankly, I couldn't give a toss! The Swedish, like many in Europe, have watched as their countries have been invaded by Muslims and done nothing about it. In fact, some have actively encouraged it by voting for people who will let this invasion continue, instead of voting for politicians opposed to Islam. Europe as a Christian continent is finished, and the highly prized Vatican city will soon be in the hands of Muslims and the popes head will be displayed on a spike outside. Goodbye Europe, the writing is on the wall, and the people themselves have done the writing! Two of these comments make me believe even more that there is no hope for Europe. Jeff speaks of the pope which begs the question 'has anybody heard him speak out against Islam, about its sadistic cruelty, its brutality toward women and it's hatred of Christianity and Jews? No because he's a puppet and will be protected from the harm that will one day to appear in the Vatican as the ugly mobs of Islam take it over and destroy it because of all the statues and paintings. Sweden's double standards are disgusting. Do the powers that be in Sweden truly believe in what they are doing? Are they oblivious to their own motives or do they know what they are doing in a sick, evil kind of way? This is crazy. We are living in such a strange time. Sweden has completely lost its way. Sweden needs to re-embrace its Judeo-christian roots if it is to survive in the years ahead.